Christopher Shannon on Menswear day at LFW SS12. Jasper Garvida was the first runway show I did where I genuinely ran out of memory card space as I loved every single outfit far too much and wanted it all for my own wardrobe. I love anything with studs and interesting details to the garment. I felt like a magpie drawn to shiny things within this show. The runway setting was interesting also as it was in a hotel dining room. The ticket I had also was a priority ticket meaning I was meant to have front row seats so I was able to nab a goodie bag as well as having preferential treatment before the show where I was taken away to a seperate room for free cocktails that the hotel made in honour of Jasper and LFW. I felt like such a little fashionista and it truly made my day! Felder Felder was my first London Fashion Week runway that I got to photograph. I was so excited as before this I had only ever photographed the runway at London Fashion Weekend as a member of the audience. But this was my chance. My first one and I was pumped! Photographers even let me use their step ladders which I was shocked about as I heard they are all mean and rude. The joys of being a 5ft girl I reckon. However I was disgusted by some of the photographers behaviour. Felder Felder sent out a few models in bikinis and the photographers had the nerve to wolf whistle and cat call them. I found it inappropriate and hardly professional behaviour. The poor models must have been so intimidated! Definitely some of the best street style I found during my spare time at LFW SS12. I just love the girl with the bird head-dress! As well as the one with the multi-tonal hair which she does all herself. Most of the street style I took was then published on Fashion156.com as part of their daily blog. Tata Naka at LFW SS12 was another presentation/exhibition that I enjoyed. It again was similar to performance art as models went down a small grassy runway and then all linked arms for photographs which came up on two screens placed in the room next to two huge soft boxes to light up the models. The background was very Monet-esque and impressionistic and geometric, which went with the beautiful floral prints on display within the clothing. The whole scene put me in a spring-time mood already as there was grass, free lemonade with flowers attached and vibrant free cake pops. It all seemed very funfair meets picnic on a lazy summer afternoon. 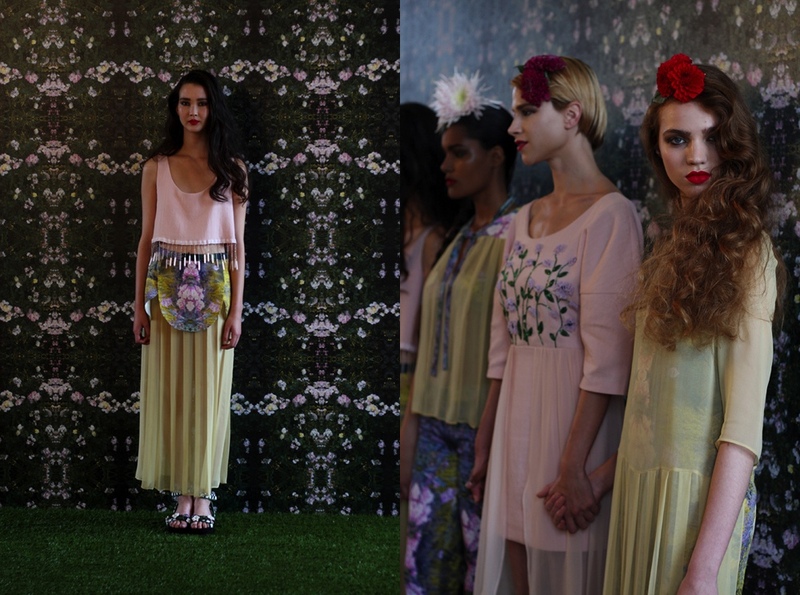 This was photographed at U.Mi-1’s presentation during LFW SS12. I found it so interesting as it was like a performance art piece. This was published online by fashion156.com as well as a piece that I wrote on the presentation, which I thought was brilliant as I have never written about fashion before. These images were published by Fashion156.com, which I photographed during LFW. One of the most theatrical shows I have ever seen. Models smoking, spreading feathers, snogging, jumping, walking nonchalantly. I loved it.